Sometimes #sundayfunday calls for a little R&R so on day seven of blogmas (skipped day six because I was relaxing with this mask), which is also a week from Christmas Eve, calls for some relaxation before the big day. And that's why I'm here to bring you to of my most recent Origins purchases and why they have been doing me so well. For a few weeks, I've been switching off every other day with these two masks and I am dying of joy. I feel like cannabis is going to quickly become the next skincare trend and Origins' has already hopped on and created a mask formula with cannabis sativa oil. 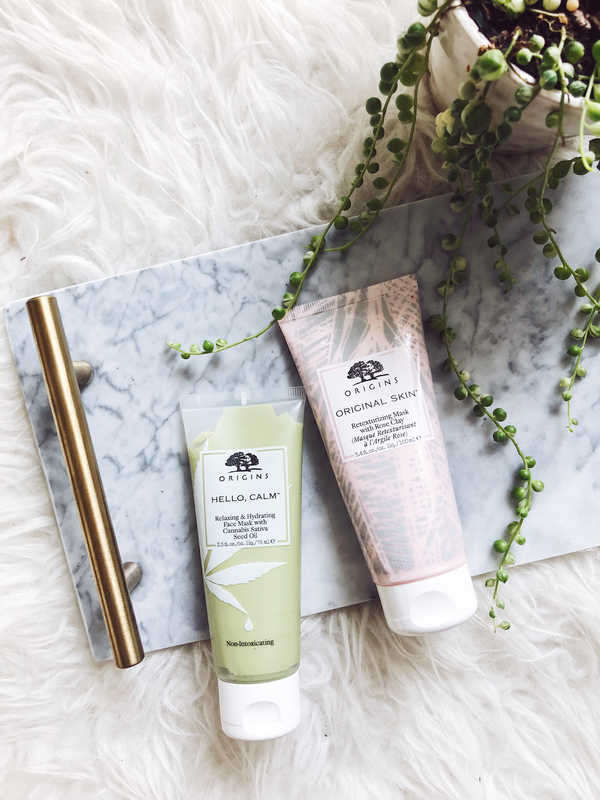 Cannabis oil can be used to relax the muscles so why not relax your skin with Origins' Hello, Calm Relaxing & Hydrating Face Mask with Cannabis Sativa Seed Oil. I won't life, the first time I used the mask, I used it incorrectly so be aware of the instructions. You apply the mask onto your skin, relax and for 10 minutes, emphasis on the relax part, and then wipe it off your skin with a tissue. Afterwards you pat in the remaining mask, which means no water or wash off is required compared to traditional masks. The first time I used it, I washed it off after the 10 minutes. You skin immediately feels so relaxed and moisturized! Moving on to the next mask is Origins' Original Skin™ Retexturizing Mask with Rose Clay. This one as you can see from the picture has a bit of an exfoliant texture to it that draws out impurities and gently exfoliates to improve your skin's texture boost radiance. This is also another mask where after leaving in on for 10 minutes and washing it off, you see immediate results. My skin always feels so soft and smooth after using it and the mask scent to absolutely to die for. Both masks are very affordable at $28 each and so a great job of relaxing you after a long day of work or even Christmas shopping! Jingle bells, jingle bells. Lashing all the way! Oh what fun it is to ride in a one-horse open sleigh, hey! On blogmas day five, we are lashing all the way with GrandeLASH's MD Lash Enhancing Serum. 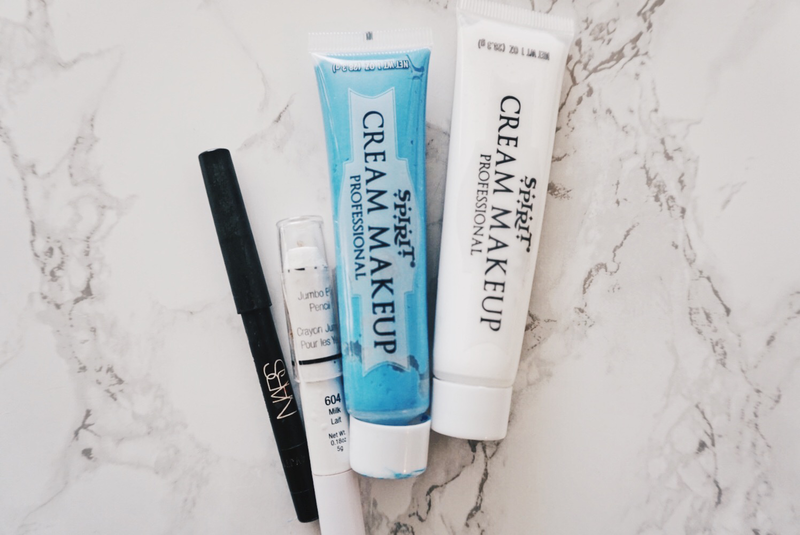 In order to get maximize your results, you need to use and finish the entire tube in three months, applying it nightly to your lash line nightly. I will admit, I've been struggling to make a habit out of this by missing a night or two weekly but I've still seen amazing results on my lashes. As y'all know, previous to this my lashes were basically nonexistent and I am not exaggerating. I'm trying to make a better habit of using it nightly so get the full results and as you've previously read on my Sephora Rouge haul, I bought the valued tube since I've been loving the results. That one has since sold out but this goes for $65, which isn't too bad if you compare it to lash extensions. Do know, this is not for long lasting lashes due to the hair regrowth cycle. You have to consistently use the product to maintain the length of your lashes but it is still worth it in my opinion. 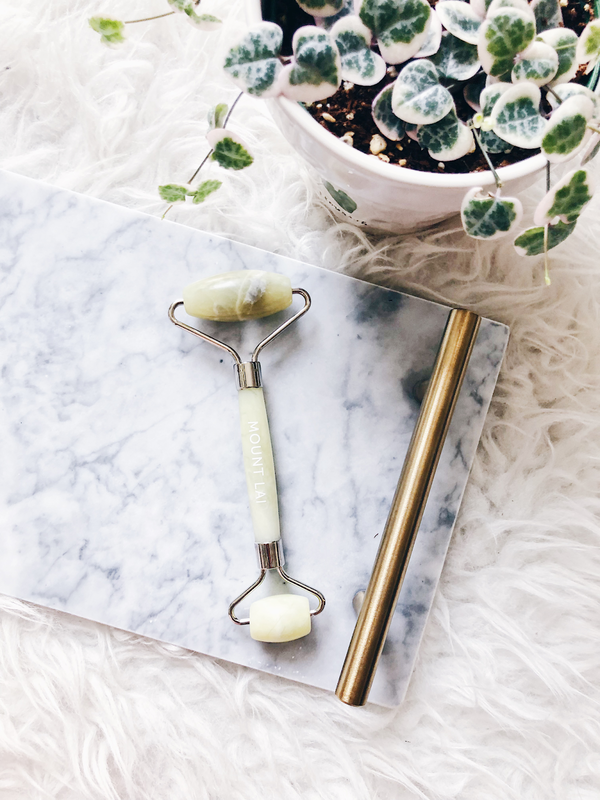 We're rolling into day four of Pineapple Lipstick's blogmas with Mount Lai's De-Puffing Jade Facial Roller that I picked up during Sephora's VIB Rouge sale. If I'm being honest, I feel like this is another Chinese transition that is getting Westernized but why not share the love when it comes to ancient Asian beauty secrets. There have been more and more skincare brands launching Jade Rollers but if I recall, Mount Lai was once of the first so that's what ultimately swayed my decision. I'm not sure if it actually works but it does feel good when I roll it across my face. This jade roller lives @ my bedside because I do it when I'm bored, while watching a movie, or when I want to make sure the serum I'm applying is absorbed all the way into my skin. It has a cooling sensation on my skin that does feel good after a long day of work and I do feel relax as I'm doing it... so maybe it does work. The standard size will put you out $34 and the mini is $20 but I honestly would just splurge for the standard size. I'm glad I jumped on this bandwagon because it def relaxes me every night as I'm rolling it across my face. Blogmas Day 3 - First Class to Amazing Unwashed Hair! For as long as I can remember, my go-to choice for dry shampoo had always been Batiste but that was only when I was going a day without washing my hair. When I committed to go blonde/silver years ago, I had to go even longer without washing my hair, on average four days and sometimes I went the whole week I could stand it. It wasn't an easy process for me to skip hair washes because I used to religiously wash my hair nightly and would not be able to sleep unless I did it. I started to notice that when I went past day two, Bastiste could not do the job of removing the excess oil from my hair so I decided to graduate to a higher end brand @ Sephora. 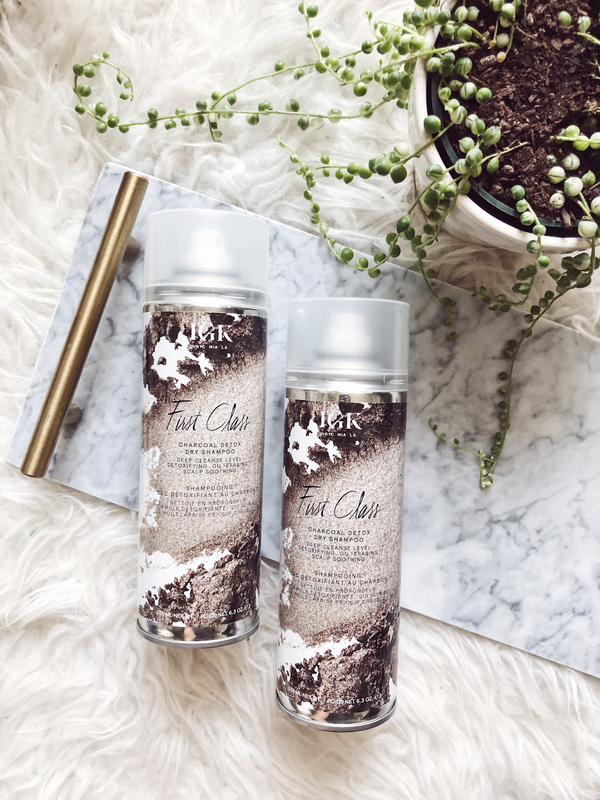 I did a ton of research and landed on IGK's First Class Charcoal Detox Dry Shampoo. I tried out one bottle and now I have these on deck. Even during my last trip home to Hawaii, I made sure my dad went to Sephora to pick one up prior to my arrival because the humidity in Hawaii + the oils in my hair don't make for a friendly combo. It smells so good and it really does the trick, even on day seven hair! If you're in the market for a new dry shampoo, I recommend giving this guy a shot. Day dos of Pineapple Lipstick blogmas is featuring all the stuff I picked up during the latest Sephora VIB Rouge sale a month ago. I haven't tried all of it out yet so this post is going to be my reasoning behind each purchase, some new, some are simple restocks! I am always weak to Sephora's holiday gift value packs because that's when you can try a variety of items and get the most bang out of your buck. 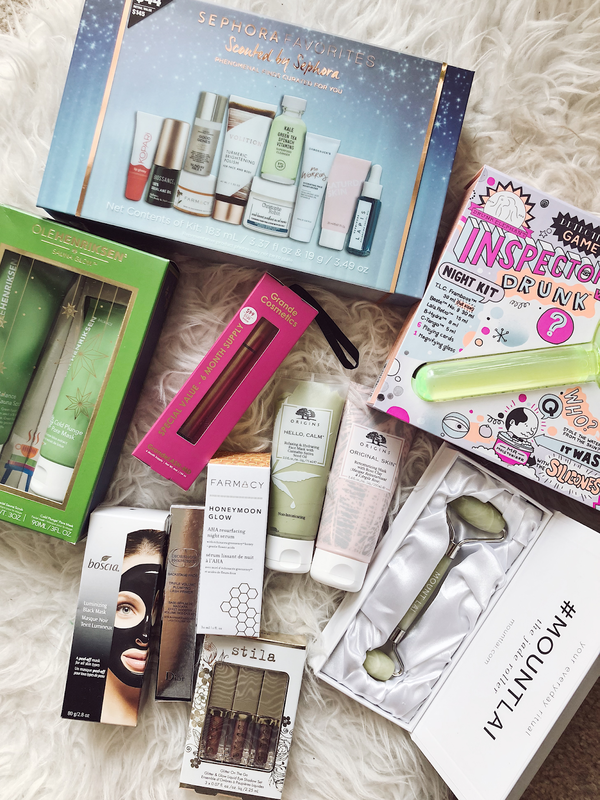 Scouted by Sephora Value Pack – I was most excited about this holiday pack because it featured 10 sample sized items from brands that are scouted by Sephora. This holiday set is valued @ $145 but sold for a low price of $44 + the 20% off deal. All the items I got in this haul were 20% off, hence the splurge. I've tried a few of these already but I could not help myself with the value I was getting out of the set. 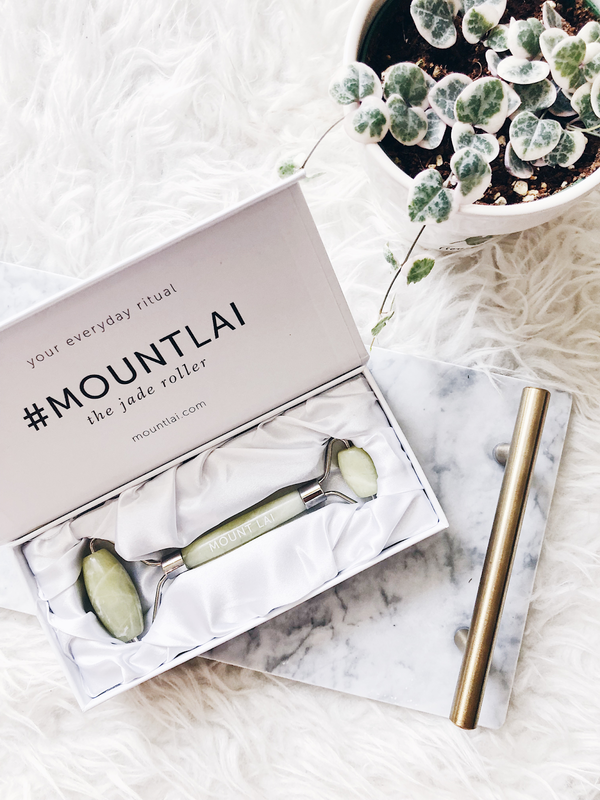 Mount Lai's De-Puffing Jade Facial Roller – So I'm Chinese and I've heard about the Jade Roller theory for quite some time now and decided to hop on the hype. I can't actually tell if this is working just yet but it does feel good in use and I keep in by my bedside. I had a hard time choosing between the pink or green one but ultimately went with the original jade color. 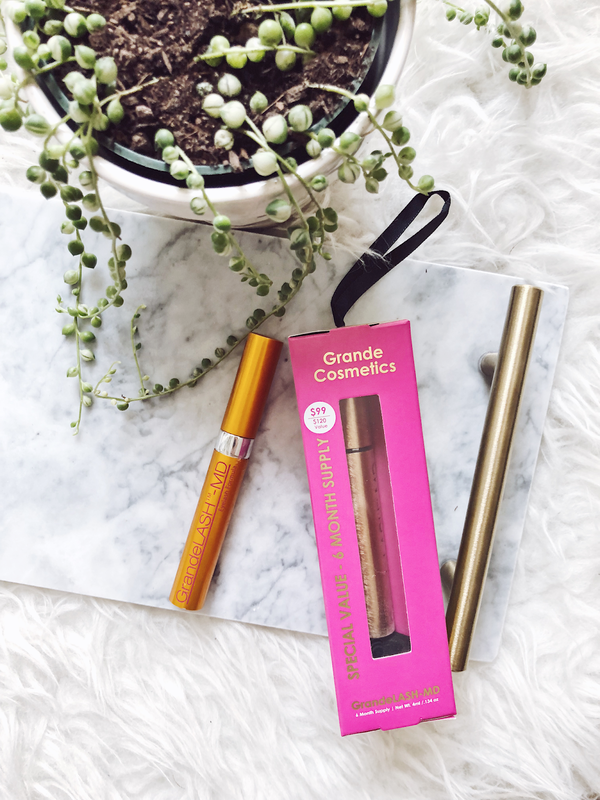 Grande Cosmetics GrandeLASH™ - MD Lash Enhancing Serum – This is actually a repurchase because I've been using a tube for a few months now and have seen a difference in my eyelashes. I could not pass up this bigger sized one valued at $120 but sold for $100 (+20% off). I knew I eventually wanted to restock so why not now. boscia's Luminizing Black Charcoal Mask – I've lost track at this point but this is probably by fourth or fifth tube of this mask. 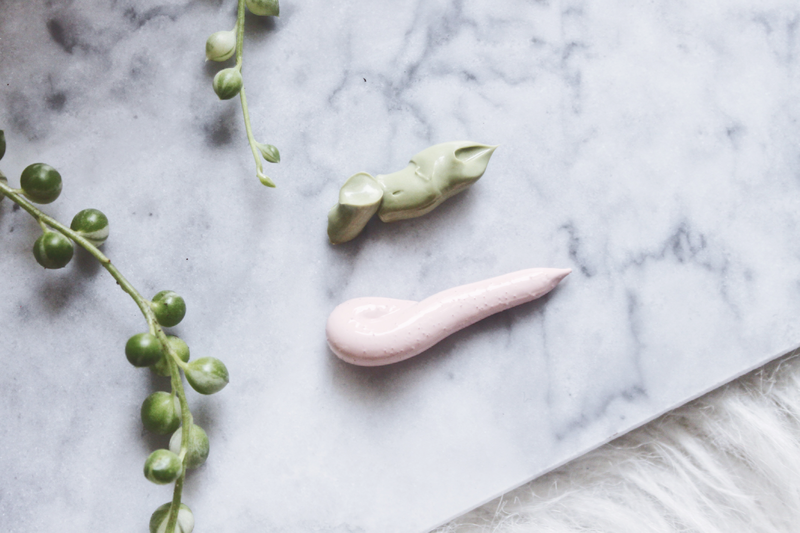 I have a full review of it here and to this day, I am still obsessed with how satisfying (although gross, I know)of seeing all the gunk pull out of your pores. Still highly recommend! Dior's Diorshow Maximizer 3D Triple Volume Plumping Lash Primer – This is also my fourth or fifth tube of this goodness that you can read more about here. I put this primer on prior to mascara and between this and the GrandeLASH, my eyelashes are finally visible compared to my past non existent ones. Drunk Elephant's Inspector Drunk™ Night Kit – This beautiful set is also unfortunately sold out at this point so hopefully you got it while you could! I know this brand is highly recommended but at it's price point, I wasn't ready to take the plunge just yet. I decided to wait for the holidays and my patience paid off because this pack is valued at $144 and I believe I copped it for $98 + 20% off. I can't wait to try these guys out and will have an update when I do. stila's Glitter On The Go Liquid Eye Shadow Set – I wanted to get a similar set last year but I waited around too long and it sold out. I knew I had to keep my eye out for it this year because glitter + the holidays go hand in hand! You get a fair amount of the best three selling colors for a fraction of the price! Farmacy Honeymoon Glow AHA Resurfacing Night Serum with Echinacea GreenEnvy™ – I read raving reviews on this serum and since I'm just about done with my Good Genes bottle, I figured why not give it a shot. This was on the pricier side so I am v thankful for the discount. OLE HENRIKSEN'S Sauna Glow Pack – This is also another acne skincare line I always wanted to try but never go around to. I think I've proved at this point I really am a complete sucker for these value packs but who cares, I tend to discover really good items and I can't wait to try these guys out. 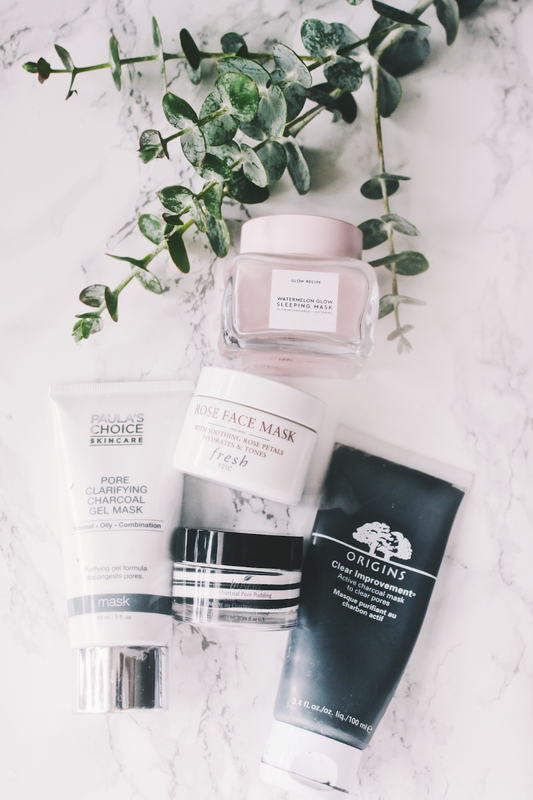 OriginsOriginal Skin™ Retexturizing Mask with Rose Clay – As I was shopping for the cannabis mask, the rose ingreident of this mask intrigued me since I just ran out of my Fresh Rose Mask, which is why this guy came home with me. More to come on how it treats my skin! If you've made it to the end of the blog, thank you so much for sticking with me as it's not a short one. Stay tuned for Pineapple Lipstick Blogmas Day three tomorrow. 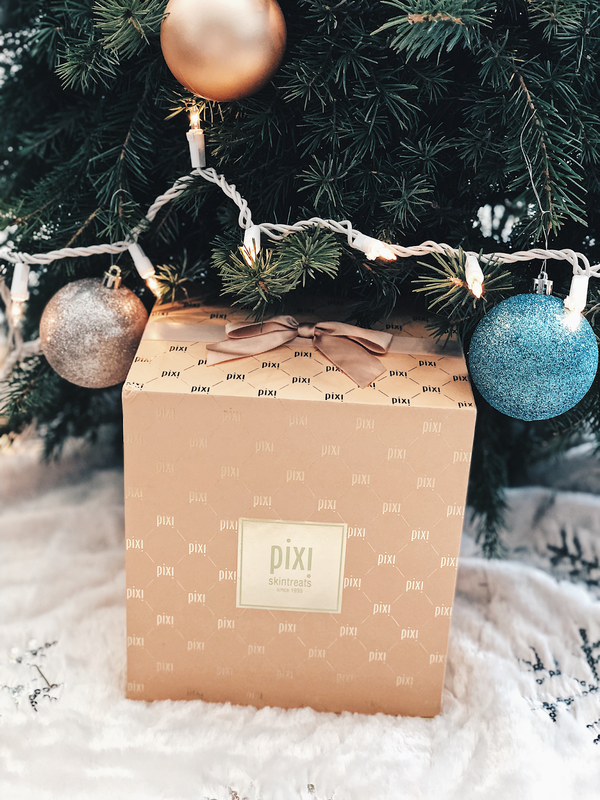 Clearly I'm jumping on this hella late but yesterday's PR package I got in the mail from PIXI Beauty really inspired me to commit to a 14-day blogmas, starting today! Vloggers/bloggers normally start the first of December but given how busy work is right now, I didn't think twice about attempting. I literally died when I opened this package and could not believe PIXI customized this Glow Tonic* bottle for me! The holiday season is my FAVORITE time of the year so why not share all the amazing beauty products and holiday editions I've been splurging on with my fellow beauty lovers! Forgive me if a miss a day or two but I'm going to try my best at a blog a day. 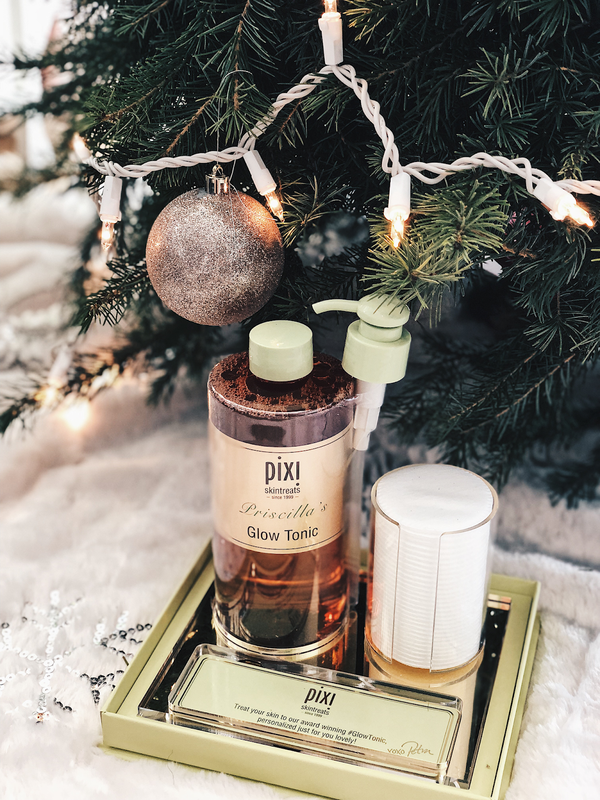 PIXI Beauty's Glow Tonic* is my end all be all facial toner! I've gone through bottles and bottles of this stuff and have yet to find something so amazing at an affordable price. It's also starting to pop up in more retail stores such as Target and Urban Outfitters because the brand is finally getting the recognition it always deserved. The Glow Tonic has a cult following and has won a Teen Vogue Acne Award as well! I religiously use this 2x a day, once in the morning post cleanse, and again in the evening post cleanse, pre mask. The Glycolic Acid ingredient helps to exfoliate the skin, the ginseng improves circulation, and the aloe vera soothes and hydrates. This leaves me skin with a glowing complexion and I have been breakout free for a few months now *knocks on wood*. I still can't get over the fact that I have my own Glow Tonic bottle that I will likely reuse over and over again once I run out. If you haven't jumped on this Glow Tonic bandwagon yet, I highly recommend you run out now and get one. Alright y'all, this late is coming a few days post Halloween but I still wanted to share! During the countdown to the holiday, I love to re-watch old Halloween classics such as Corpes Bride and Halloweentown. With that, I immediately got inspired to be the Corpes Bride for Halloween! It was an easy face paint job and I could've worked harder by getting a blue wig but I honestly just wanted to use what I already had. 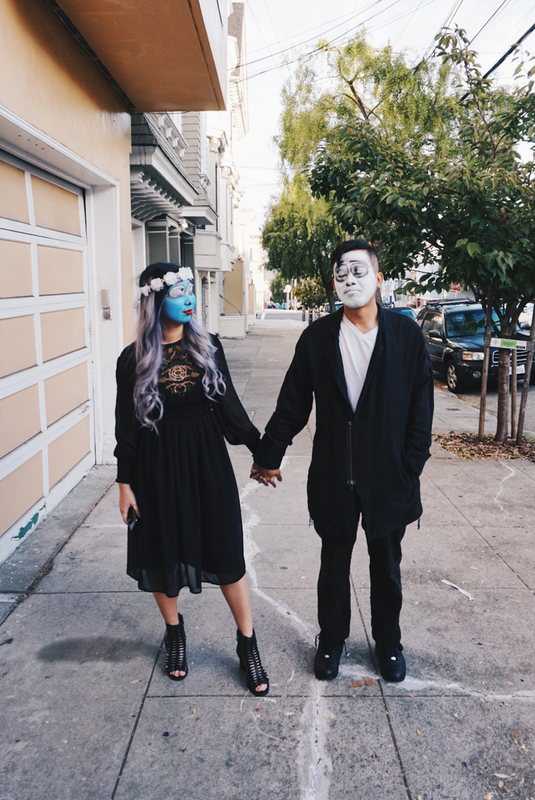 The dress, flower crown, and makeup were all things I already had. 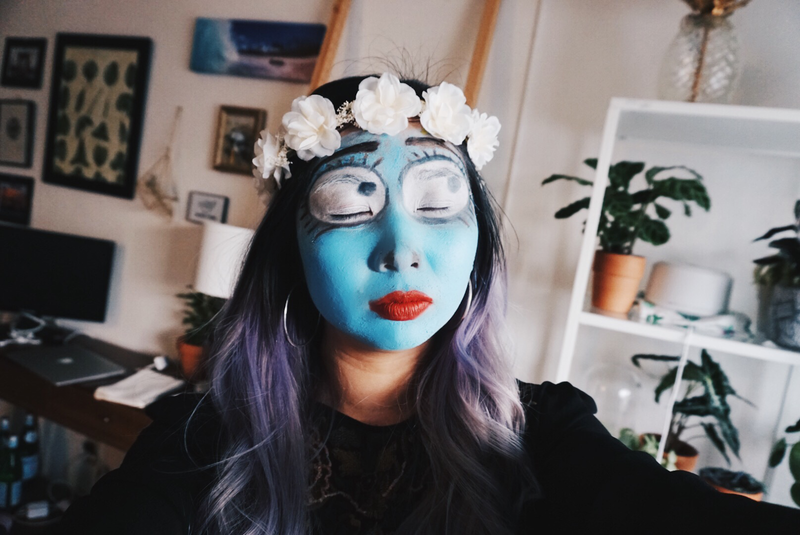 The only two items I had to purchase was the blue and white face paint, which I grabbed last minute from the Spirit Halloween store and I think they were $3 each so they were very affordable! 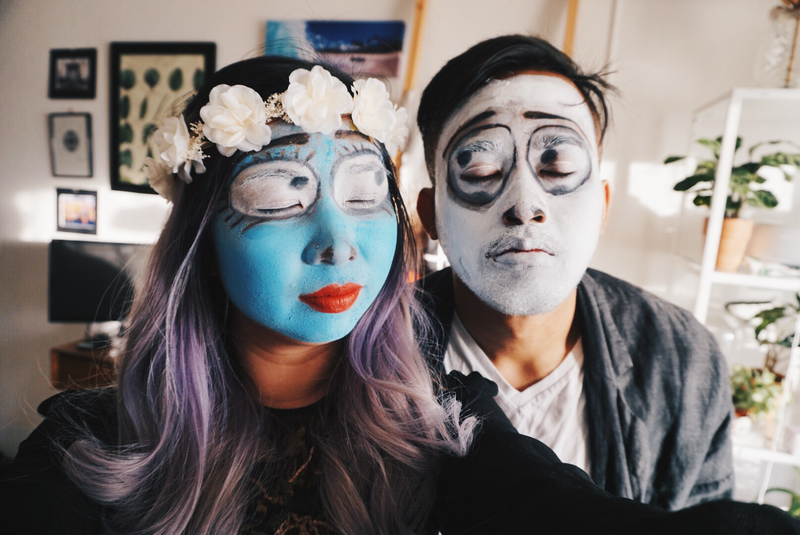 As you can see from the photos, my other half was very cooperative in letting me paint his face as well haha. 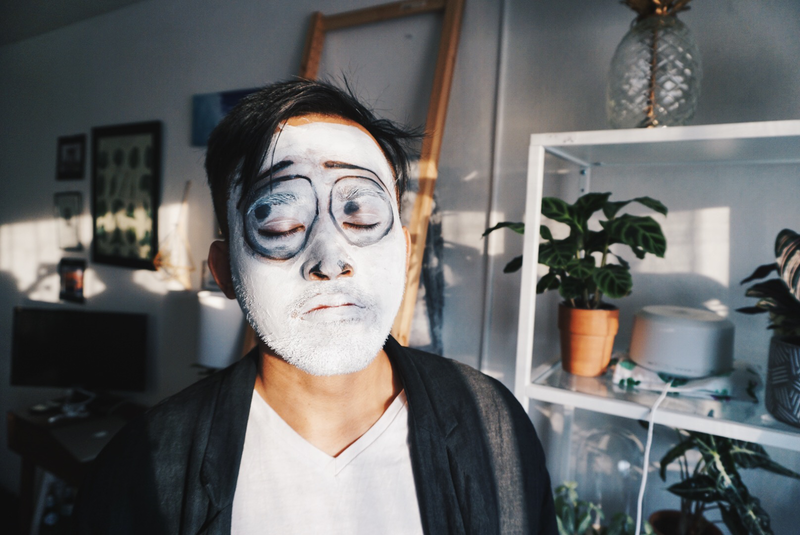 I'm still waiting for the day he lets me put makeup on him but this will do for now ;) The makeup was super easy, I prepped my face with the proper skincare first + primer because I had no idea how my skin was going to react to the face paint. Within 3-4 hours, the paint started to crack off so I did have to retouch throughout the day. However, it all washed off easily and even though there were no immediate signs of a bad reaction to the paint, I still did some major masking during the next few days just to be sure. Halloween is a super fun holiday that I always poorly plan around but something always comes through the last minute. I'm already looking forward to next year but in the meantime, we're finally on the countdown to Christmas! 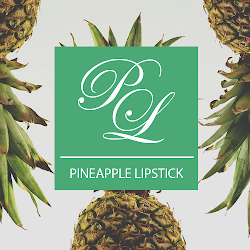 Pineapple Lipstick is back in business - I can't believe the last time I wrote a post was back in March of this year! The last advertising client I worked on took left me little to no free time to continue this fun hobby of mine but now that my work load has freed up a bit, I'm hoping to get back onto a regular posting schedule. My purchases at Sephora has since decreased though over the last few months because I've been prioritizing my budgets towards more 'adulting' things such as an overhaul of furniture upgrades in my apartment + finally creating a makeshit home office. If you continued to follow me on Instagram, you'll see a ton of money was spent at West Elm. Maybe I'll do a post on that - we'll see lol. Anyways, let's get into the real beauty stuff. Lately my skin has the best it's ever been in my adult life *knocks on wood*. Now that my acne has cleared up, I'm focusing on my pores and the texture of my skin. The current masks I have on rotation for these two problems areas are below! I copped this guy during a Sephora sale since it had raving reviews but I don't know exactly how I feel about this yet but it could be because my expectations were set really high. Note, I didn't previously sample the mask before purchasing. When I was growing up, watermelon was favorite fruit (it's second now behind mangos) and whenever my mom cut it up, she would give me the rinds to wash my face and it remember it being so refreshing and feeling amazing. I expected the mask to give me a similar feeling but it didn't. The mask barely smelled like watermelon. However, even though the mask experience wasn't what I imagined, the mask still led to great results. The mask felt more oil-like than gel even though the formula is oil free. I pat in a generous amount into my skin right before bed and I wake up with dewy skin! I've used it a ton of times and I've barely made a dent in the jar. I actually grabbed three of these guys that were the mini sample 100 point items at Sephora months ago. I've never met a boscia product I didn't love so I knew I should stock up. I'm also pretty picky about what samples I spend my points on - I prefer to hold off for the good stuff ;) The mask alone looks really cool because of the black and white swirl. White charcoal is known to absorb 1,000x its weight in impurities, purifying and deeply cleaning your skin. You take a generous amount and apply to your face all while mixing the formula together, which then creates a grey color. You leave it on for 15-20 minutes. The jar is deceiving because it looks tiny but you actually can get a ton of uses out of it. The texture of my skin and pore size has definitely improved over the last few weeks of using this. Once I run out of the samples, I will be purchasing the full sized one! If my memory serves me right, I copped this guy last Fall during the Sephora sale. I personally feel like people sleep on the Origins brand more than they should. Origins was one of the first brands I was introduced to as a teenager fighting acne that I've been loyal to since. Their masks are fairly priced and has amazing results. They have recently been rebranding their packaging so I hope that helps more people to jump on the brand. This deep clean masks focuses on the two main parts I'm focusing on 1. pores 2. texture. I use it twice a week, leaving it on for 10-15 minutes at a time depending on how quickly it dries down. The formula helps flushing out environmental toxins, dirt, and debris that can clog pores and cause skin to look dull—leaving. I'm not going to go too much into detail here as there is a dedicated blog post to the mask here! However, I have so much masks that this actually fell victim to the bottom of my skincare drawers. I recently re-discovered to finish it off since it was about 2/3 empty. I absolutely loved this one but will hold off on repurchasing for now. It smells amazing and did wonders to my pores but at the price point is a tad steep. I'd rather spend the money on Fresh's Rose Deep Hydration Facial Toner, which I haven't tried yet but there are a ton of positive reviews on it. This one is very similar to the Origin's mask in my opinion except for the fact that it's gel. Because it is a gel, the formula doesn't dry down the way the Origins mask does. I hear a lot of good things about this brand and it was my first time trying it out. There really is no greater feeling than topping off a long work day with a relaxing mask. I leave it on for 10-20 minutes and wash off. Your skin immediately feels smooth with minimized pores. It's also really easy to wash off since it doesn't dry down. I def recommend this one, especially since it's really affordable!